Formamides, an important class of the amine derivatives, have widely used in the synthesis of the pharmaceutically valuable compounds. The N-formylmorpholine is chemically stable, non-toxic, and non-corrosive, due to its unique structure, aliphatic hydrocarbons, aromatic hydrocarbon and water compatibility, and the dissolved aromatics which greatly reduces the relative volatility of the aromatics. 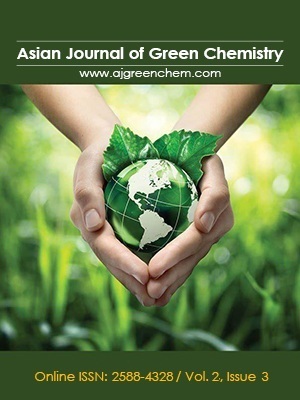 In this research, we evaluate the synthesis of the N-formylmorpholine as green solvent from the reaction of the morpholine and formic acid under optimization conditions (Pressure=1 atmosphere and temperature=224 °C) in high yields. This compound was used as the green solvent for synthesis of the heterocyclic compounds.